Fia is the eldest daughter of Reed, one of the triplets from the Legendary Bastards of the Crown Series. With her skill of being able to read people’s actions, she is bound to do some amazing things. 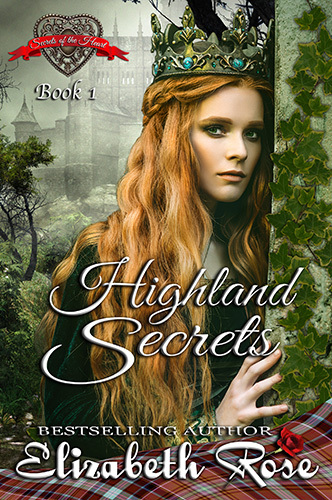 Fia looked over her shoulder for the tenth time, watching for Highlanders to jump out of the bushes. Thankfully, she hadn’t seen or heard any. However, she did see several dead Scots and also some dead English soldiers on her way to the secret garden. Knowing Lord Beaufort would be scouting the woods as soon as the sun rose, she hurried, wanting to check on Imanie and get back before the men found her in the forest all alone. As she approached the gate to the secret garden, something sparkled from the ground, catching her eye. “My bracelet!” she said excitedly, jumping off the horse to see Willow’s brass button reflecting in the early morning sun. She scooped up the bracelet, bringing it to her lips for a quick kiss. This had to be a good sign. Everything was going to be all right. “Imanie,” she called out excitedly as she approached the gate. But the smile disappeared quickly from her face when she realized the gate was open and there was a bloody handprint upon it. Holding the reins of her horse, she slipped the bracelet into her pocket and ventured forward. Was Imanie hurt? Seeing a bloody handprint could only mean one of two things. Either Imanie was injured, or possibly the blood came from someone else. The handprint looked larger than a woman’s hand. Her head told her to turn around and run, but her heart wouldn’t let her leave until she knew Imanie was safe. Cautiously and carefully, she entered the garden, ready to jump on her horse and ride away at the first sign of danger. She hadn’t gone more than a few steps into the secret garden when she saw the red and brown plaid of a Highlander on Imanie’s porch. She froze, wondering what a Highlander was doing inside the secret garden. The man was down on his knees. When he got up, she saw Imanie lying on the ground, and she wasn’t moving. “Nay!” she shouted, not wanting to believe her mentor was dead. But by the look of fear in the old woman’s open eyes, it told Fia that the Highlander had killed her. She started to mount her horse, but the man’s words made her stop. “Fia, wait! I need yer help,” he called out. With one foot in the stirrup, she looked up slowly, wondering how this rugged Highlander knew her name. From across the garden, she recognized his long, dark hair and his stance. His voice was familiar, too. Aye, she knew him. It was the chieftain of the clan of Highlanders she’d met in the woods three years ago. He was the man who stopped his men from killing her. It was because of him she was still alive today. “Fia, come here. Please,” he called out, collapsing atop a wooden bench on the porch. His head fell back, and she noticed the look of pain on his face. Then she saw the blood on his clothes and the way he held his hand against his side. He was wounded!